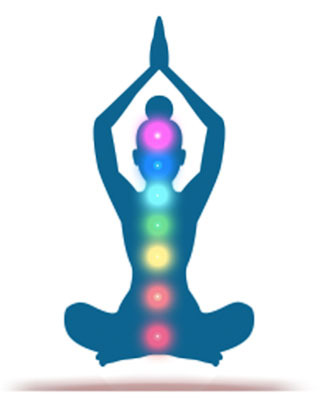 Your 7 Chakras are the gateway to your greatest life. From the Root Chakra at the base of your spine, moving up to your Crown Chakra at the tip of your head, each one shapes a unique aspect of your reality. When a Chakra is strong, its corresponding area of life prospers. But when it's blocked, you'll experience difficulty, frustration and resistance to positive change. Your Root Chakra influences your financial prosperity and sense of security in life. It may be blocked if you have trouble growing your income, saving or spending money, or even if you just tend to feel you never have enough to get by. Your Sacral Chakra is the throne of your creativity, sense of intimacy and connection. It may be blocked if your sexual desire or openness is on the low side, or if you find it hard to express your creative energy. Your Solar Plexus Chakra controls your sense of self-worth and self-esteem. It may be blocked if you often doubt yourself and question whether you deserve to achieve your goals and dreams. Your Heart Chakra determines your ability to love without restraint. It may be blocked if you're experiencing relationship challenges, or if you find it hard to empathize and get close to people. Your Throat Chakra influences your ability to speak your truth. It may be blocked if you feel hesitant to express your opinions, or if you feel disconnected from your true voice. Your Third Eye Chakra controls your sense of intuition and insight. It may be blocked if you have trouble making intuitive decisions, or if you can feel a sense of distrust in yourself. Your Crown Chakra controls your spiritual connection to yourself and the Universe. It may be blocked if you feel disconnected from the people and environment surrounding you, or if you struggle to find meaning in your life. Energy is the living, vibrating ground of your being, and it is your body's natural self-healing elixir, its natural medicine. This medicine, this energy medicine, feeds body and soul, and attending to it restores your natural vitality. Energy medicine is the science and the art of optimizing your energies to help your body and mind function at its best. That's why we've created Chakra Awakening: a complete Chakra healing system filled with powerful tools and technologies for strengthening and protecting your Chakras - and in turn, your life. 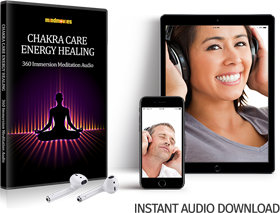 Whether you're an experienced Chakra healer or a complete beginner, we've designed this system to be the most transformational, intuitive and easy-to-use Chakra healing solution available to you today. Just answer a series of simple mind-body questions, and you'll receive an instant and highly accurate 'diagnosis' of how energized or blocked each of your Chakras are. It only takes a few minutes! And remember, since the state of your Chakras is constantly shifting, it's good to keep going back to this blueprint each time you need an energetic tune-up: like when you can feel resistance coming from inside you, or when you encounter a challenge or change in your life. Once you’ve discovered which of your Chakras needs work through the Chakra Healing Blueprint, use the corresponding Chakra Charge-Up sets. 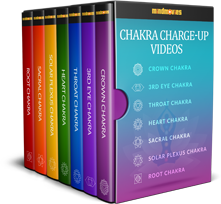 Each set contains a fascinating tutorial video that takes you deeper into the nature of each Chakra, including what happens when it’s weak and strong, plus simple techniques, food and lifestyle tweaks for unblocking and protecting it. 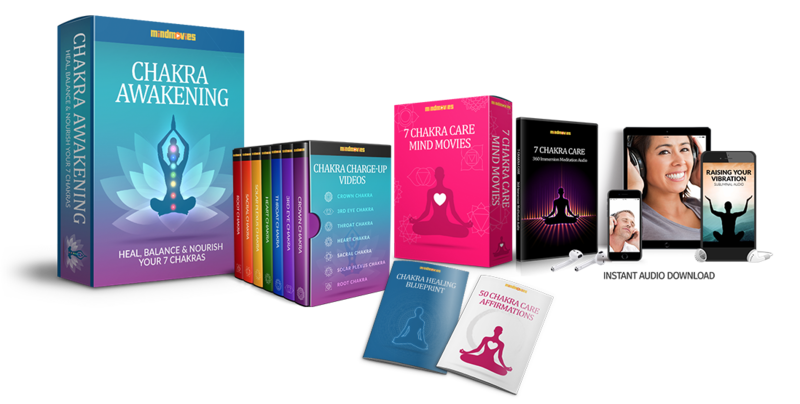 Plus at the end of each one you’ll find an exhilarating 3-minute micro-visualization exercise that instantly strengthens the corresponding Chakra with your mind power. In case you're not familiar with Mind Movies, they're our single most popular personal growth technology of all time. Mind Movies combine visualization, affirmations and uplifting music and imagery to give you an instant energetic boost - and they're as easy to enjoy as watching a music video on YouTube. Just play your Mind Movie, sit back, and let the embedded technology get to work on your energetic ecosystem. It couldn't be easier than that. 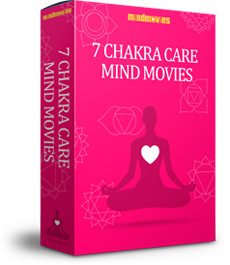 I recommend spending a few minutes every morning watching your Chakra Care Mind Movies - just pick the Chakra you want to focus on, and press play. This Chakra Care 360 Immersion meditation takes you on an exhilarating 20-minute journey into your energetic ecosystem to energize your seven Chakras from bottom to top. It’s infused with specially engineered relaxation music that helps you focus - even if your mind has a habit of wandering. For best results I recommend using your meditation at least once a week, either in the morning or just before bedtime, whichever you prefer. 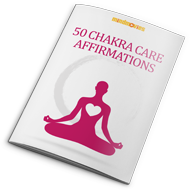 In this handy printable PDF document, you'll find 50 Chakra Healing Affirmations spread out across the seven Chakras. Use these in your meditations, Mind Movies, visualizations, or even just recite them every morning to keep your Chakras whirring in energetic harmony. Think of them like mini espresso shots of energetic goodness! Raising Your Vibration is a 60-minute subliminal audio that projects hundreds of thousands of positive affirmations into your subconscious mind. These affirmations then ‘command’ your subconscious to be more positive, energetic, and to vibrate at a higher level - making it a great complement to your Chakra healing. Even better, you can play this subliminal audio in the background, when you’re working or doing your daily chores. No conscious effort or focus is needed, it does all the work for you. We believe you should never pay for training that doesn’t live up to its promises. 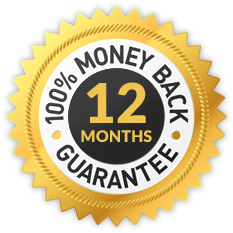 That’s why our programs all come with our unconditional 60-day money back guarantee. 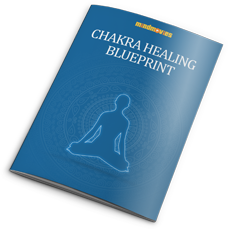 Chakra Awakening, however, extends that guarantee by a whopping 600% - meaning you can test drive the whole system for an entire year with total peace of mind. And receive a full refund in that time if for any reason you’re not overjoyed with it. That’s how much we want you to step into an energetically empowered life. And that’s how confident we are that the Chakra Awakening system will get you there.